For centuries, scholars have found different explanation for eye floaters, the mobile, scattered and transparent spheres and strings in our visual field. Early on, the origin was thought to be in the eye and the phenomenon was considered a disorder or degeneration somewhere between pupil and retina (Plange 1990). 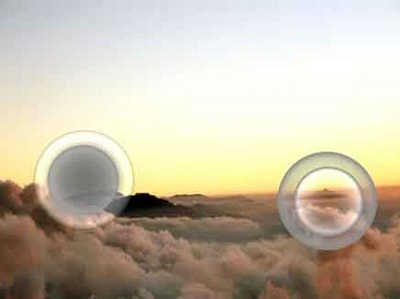 Today, eye floaters are believed to be an opacity of the vitreous. However, careful observation of floaters reveals regular structures that call the degeneration thesis into question. These structures strikingly resemble the morphological and functional structures of receptive fields of the visual nervous system. Thus the hypothesis of this article: so-called “idiopathic” (harmless) eye floaters are a visible expression of neuronal processes. 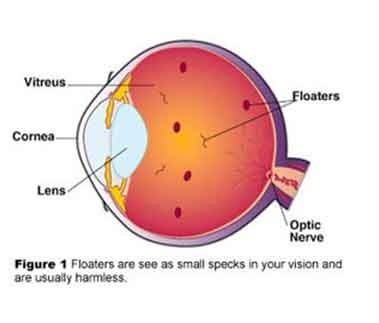 In ophthalmology, “eye floaters” is a collective term for vitreous opacities which are attributed to different causes. In most cases, the phenomenon is considered a non-pathological (idiopathic) age-related clouding of the vitreous body. This wide-spread symptom occurs due to liquefaction (synchysis) and the collapse of the collagen-hyaluronic structure of the vitreous (syneresis), which causes at some stage the detachment of the vitreous from the retina (posterior vitreous detachment) (Sendrowski 2010). In daylight, degenerated vitreous structures which are clumped together cast shadows on the retina and become visible in the field of vision. Supposedly, this is what we see when we are looking at our mobile, scattered and transparent dots and strings. In my opinion, this ophthalmological description of the spheres and strings as a “disorder” or “vitreous opacity” is a myth, based on too much theorizing and only superficial observation of the phenomenon. I suggest that floaters reflect a dualistic-polar organizing principle, which has, to some individuals, cultural or spiritual significance, but which also resembles the properties of receptive fields, an important aspect of the visual nervous system. To illustrate this, I firstly present important distinctive properties of floaters that reveal through close observation, and then look for structural similarities in the neurology of vision. As an underlying theory, I assume that any phenomenal order in the perceptual experience corresponds with dynamic neurological organizing processes in the brain. This idea was originally developed as “isomorphism” by Gestalt psychologists (Köhler 1938; cf. Lehar 2004) and is – with regard to entoptic phenomena (cf. Trick 2007) – further reinforced by recent physiological research of entoptics, suggesting that these phenomena reflect the spatial organization of the neuronal structures of retina and cortex (Kent 2010; Bressloff et al. 2002; Cowan/Ermentrout 1979). In-depth observations of floaters reveal distinctive structures that are not considered and explained by ophthalmology (cf. Tausin 2011). Floater spheres are circular and concentric. They contain, clearly distinguishably, a core and a surround, viz. they are polar. The polarity is joined by a dualism, for there are two types of dots: those with bright surround and dark core, and those with dark surround and bright core. So we can speak of a dualistic-polar principle in floaters. Fig. 2: The two contrasting types of floater spheres. Source: FT.
Morphologically, this principle is reflected in the visual nervous system. Nerve cells, or neurons, of the retina, the visual pathway and the visual cortices in the brain are also organized according to a dualistic-polar principle: the so-called receptive field (Freenlee/Tse 2008; Gareis/Lang 2007; Park 2007; Schiefer 2007; Witkovsky 2007; Goebel et al. 2004; Quillen/Barber 2002; Flores-Herr 2001; Greenstein/Greenstein 2000; cf. Franze 2007). 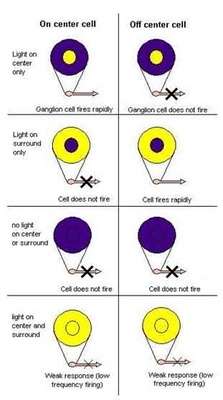 To understand what receptive fields are, let’s look at the way of the light in the visual pathway: Light stimuli are first received by the light-sensitive receptors (retinal cones and rods) and forwarded through different layers of neurons: Cones and rods forward the stimuli to bipolar cells; the latter transmit the information to ganglion cells; from there, the impulses are forwarded through the neurites to the different neurons in the visual cortices in the brain. Bipolar, ganglion and the cortical neurons receive their light stimuli from their receptive field, a defined area in the visual field. 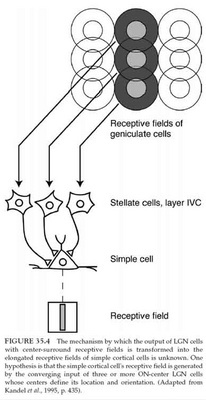 For example, a bipolar cell answers to stimuli from cones and rods that belong to its receptive field; in turn, it forwards the stimulus to the ganglion cell to which receptive field it belongs. These receptive fields are circular concentric fields that are characterized by a center and a surround. Therefore, the full technical term is “center-surround antagonistic receptive field” (CSARF). There are two types of neurons that can be distinguished according to the function of their receptive fields: those that respond to light on their center (on-center) and those that respond to the illumination of their surround (on-periphery or off-center). 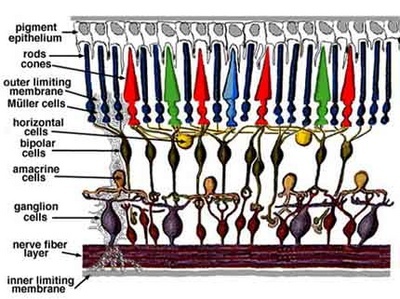 Stimulating photoreceptors in the center of a receptive field of an on-center bipolar cell excites the membrane of that bipolar cell (depolarization); the cell transmits this stimulus to the appropriate on-ganglion cell which likewise increases the discharge rate (action potentials per unit time). The same on-bipolar cell is inhibited (hyperpolarization) if its surround is illuminated, i.e. its discharge rate decreases. The off-center bipolar cell behaves contrary: Light on the center decreases the discharge rate; light on the surround increases it. Both bipolar cells and ganglion cells receive their inputs not only from light sensitive receptors (vertical pathway) but also laterally from amacrine and horizontal cells (horizontal pathway, cf. fig. 3). These forward the signals in the surround of a receptive field and cause the opposite reaction of each neuron when the surround is stimulated. Thus, amacrine and horizontal cells are part of the center-surround antagonism which contributes to focused and distinctive vision. Both the receptive fields and the floater spheres are organized by the same dualistic-polar principle. This indicates the possibility that idiopathic floaters are not a “disorder” in the vitreous body, as advocated by modern ophthalmology, but an effect of the nervous system’s visual light processing. The question is, how potent is that model in explaining further important and distinctive characteristics of floaters, as observed and described by the author (Tausin 2011)? The most obvious question is how it comes that we actually see receptive fields. To answer that, let’s have a look at the studies of mathematicians Bressloff et al. 2002 and Cowan/Ermentrout 1979 (cf. Meyers-Riggs 2011). They showed that entoptic patterns like phosphenes or form constants (Klüver 1966) arise from neuronal cortical structures. The cortical hypercolums – cells in the first layer of the visual cortex (V1) that respond to light input shaped as lines – are linked together in a manner that creates noise patterns of certain types. On the basis of the biological evidence that straight lines in the V1 are represented as curved lines on the retina, the researchers develop a mathematical model. Applied to the types of visual cortex noise, this model produces neuropsychologist Heinrich Klüver’s types of form constants (a special kind of entoptic phenomena), which he described when experimenting with mescaline (Klüver 1966). These studies show that entoptic phenomena have a neuronal correlate. However, they do not address what I think is the main question: How and where exactly is the light that is received by the retina turned into visual consciousness? This is debated in today’s (neuro-) ophthalmology (Goebel et al. 2004), as the neuronal correlate of consciousness is still a mystery to neurologists in general (Crick/Koch 1999). Fact is that visual experiences feed from external stimuli which are, however, neurally processed; viz. they are constructions of the nervous system (cf. Lehar 2004). The cited studies seem to suggest that visual awareness (of entoptic phenomena) takes place only in the retina which is equated with the visual field. Many cognitive scientists, on the other hand, think that there are specific neurons in the cortex – in that case the visual cortex – that represent the neuronal correlate of consciousness (Goebel et al. 2004; Crick/Koch 1999). Contrary to this, I assume that visual awareness can take place in all of the neuronal layers of the visual pathway, from the retina to the higher layers of the visual cortex. I refer to the finding that simple visual forms correspond to earlier processing stages (retina, lower cortical layers) while more complex forms are extensively processed in higher layers of the optic center (cf. Kent 2010; Goebel et al. 2004; Greenstein/Greenstein 2000). Therefore, I suggest that the visual experience of one and the same set of stimuli differs in terms of visual complexity and integration, depending on what level of neuronal processing visual awareness is aroused. Floaters, then, may be understood as the subjective visual realization of neuronal stimuli on an early (e.g. retinal, bipolar layer) stage of processing. The stimuli, canalized through receptive fields, are not yet processed to complex images, but transmit relatively simple and isolated properties such as shape and color contrasts – the properties of receptive fields. The question, then, is: What is this principle that decides on what level visual awareness gets aroused? Or, to put it another way, what is this principle that decides whether a nerve impulse comes to awareness as an isolated receptive field or floater, or whether we perceive it integrated and interpreted as a part of the image we call “the objective world”? For lack of a better term, I call it the “principle of consciousness”. This consciousness principle might resolve the next question: If there is an abundance of receptive fields in the visual nervous system, why are we aware of just a few projected receptive fields in our visual field – just a few scattered floaters, respectively? I propose the following: On the one hand, this abundance can actually be seen as entoptic phenomena in certain circumstances – e.g. by squinting at the sun (Tausin 2010). On the other hand, the fact that floaters are indeed experienced as specific and persistent structure indicates that the consciousness principle brings a certain pattern of stimuli to visual awareness on an early level of neuronal processing. Referring to psychological or anthropological studies on entoptic phenomena and psychedelic drugs (e.g. Reichel-Dolmatoff 1978; Klüver 1966), I suggest that the consciousness principle does this according to the current state of consciousness of a person. According to this line of thinking, one might say that what we see in floaters is the neuronal correlate of our current state of consciousness. This is where the observation of floaters may have a spiritual significance to some individuals, if it is put into practice as a meditative investigation of one’s own consciousness. 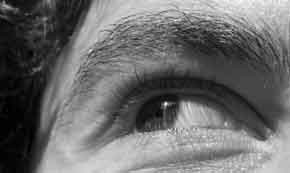 Another question concerns the obvious movement of floaters: If floaters are the visual expression of immobile receptive fields in the retina, in the visual pathway and the cortices – how can we understand their motion in our visual field, often even influenced by our own eye movements? Here too, the consciousness principle provides a possible solution, along with the psychological concept of “apparent motion/movement”. The latter designates moving impressions that do not arise from moving environmental stimuli, but from stationary stimuli, which are shown in sequence. As it is the case with cinematic images which are projected to the screen in rapid sequence and, thus, allowing our brain to experience a moved picture, our experience of moving floaters might be the result of successive stimulation of different, but self-similar retinal and cortical regions. In our theory, these effects may, however, not be caused by external stimuli alone, but by the consciousness principle. One objection to this might be that we obviously move our floaters by eye movements. My answer is that our physical movements cannot be separated from the consciousness principle: Our physical activity is a result of our state of consciousness; conversely, physical and mental movements such as eye movements, concentration, emotions, etc. stimulate our nervous system, alter consciousness and, in that way, may cause perception of movement, or apparent motion respectively. There is even evidence suggesting the close connection between the activation of the muscles around the eyes and the perception of entoptic phenomena: rapid pulsation of eye muscles may be related to inhibiting or exciting the cortical columns that control optic muscles and may produce phosphenes (Kent 2010). If correct, this means that we do not move our floaters with our eyes, but our eyes are moving in accordance with the dynamic, visually perceivable expression of our consciousness. It means that we are causing our floaters to flow or to stop by our psycho-physical movements, or, to put it another way, by our consciousness. Let’s continue with another important observation: Obviously, our floaters not only consist of spheres but also of strings. This might be the subjective visual expression of the fact that in certain cortical areas, the receptive fields of neurons are not circular and concentric, but elongated. They are strips of different spatial orientation. This means that neurons with elongated receptive fields strongly react to linear light stimuli like lines, columns, strips, etc. In addition, they are characterized by “orientation selectivity”, i.e. they are pitched to particular angles and orientations of these light lines. In ophthalmology, it is not yet fully understood how the output of neurons with center-surround receptive fields is translated into the orientation selectivity of the cortical neurons. A widely acknowledged hypothesis is that the elongated receptive fields in the cortex are, in fact, overlapping inputs of cells located in the lateral geniculate body. Those cells have, like bipolar and ganglion cells, circular receptive fields and end in the same receptive field of a cortical neuron (Goebel et al. 2004). Fig. 5: From floater spheres to floater strings? Source: Goebel et al. 2004. Understanding floater strings as several spheres strung together not only corresponds to the subjective observation of floaters (although sometimes there are strings that seem to be empty); it also fits the fact that more complex forms – like floater strings filled with spheres– are represented by neurons in the higher visual centers of the brain (cf. Greenstein/Greenstein 2000; Goebel et al. 2004). Another important, though not common, observation is that floater spheres and strings show different states over time: one and the same sphere can appear as big and rather hazy or as small and clearly outlined. The transition from one state to another is fluent and proceeds in different time duration. In general, it seems that most floaters are initially relaxed, viz. bigger, closer and more transparent; with increasing time of observation, they change into the concentrated state. In addition, the spheres and strings increase in brilliance the more concentrated they are (Tausin 2011). Fig. 6: The two kinds of floater spheres in transition from a relaxed (left) to a concentrated (right) state. Source: author. One possibility to explain that observation neurologically is to relate the floater size to the successive stimulation of different retinal and cortical regions. While in case of the observation of lateral or horizontal movements of floaters (see above), these regions are successively stimulated laterally, here they are stimulated vertically. In other words, the transition from one floater state to another corresponds to the transition of visual awareness from one neuronal layer to another. The simple and abstract information of every neuronal layer differs not in shape, but in size. Let’s turn to the changing luminosity in floaters. How come that we perceive light in floaters at all? An answer is provided by Hungarian bioengineer Istvàn Bókkon who, referring to the phenomenon of bioluminescence, suggest that neurons emits light which we can perceive. He shows that nerve cells can transform electrical signals through processes of bioluminescence into ultra weak light. This light, or the emitted biophotons respectively, not only serves the intra- and intercellular communication, but can be perceived by us as entoptic phenonenon, e.g. as phosphenes (Bókkon 2009, 2008). It is thus conceivable that the light in floaters arises from varying electrical/biophotonic discharge of neurons. The theory of awareness on different neuronal layers, together with the notion of light emission of discharging neurons, is sufficient to explain the relationship of size and luminosity observed in floaters: When we are in concentrated states of consciousness, visual awareness takes place in “lower” neuronal layers (I suggest: closer to the retina) with cells firing faster; being in more relaxed states of consciousness corresponds to visual awareness on “higher” layers with neurons less excited. This whole process is controlled by the consciousness principle, but also influenced by exterior stimuli. In this article, I proposed a neurological explanation of eye floaters. A particular structure of neuronal processing seems to correspond to the structure of floater spheres and strings: the receptive field. Starting from receptive fields, I tried to understand some of the more important observations of floaters in terms of neuronal processing, assuming a “consciousness principle” that decides on what stage of processing visual awareness is experienced. This work cannot prove the claims it has made, many questions remain. The text is intended to give new impetus to the further exploration of so-called floaters, starting from subjective observation. Especially the inclusion of the subject allows for a variety of different interpretations and explanations, not only ophthalmological or neurological, but also psychological, historical, anthropological and spiritual – a step towards a comprehensive science, which can complement isolated academic accounts on eye floaters and other entoptic phenomena. Crick, Christof/Koch, Francis (1999): In: The MIT Encyclopedia of Cognitive Sciences, ed. by Robert A. Wilson and Frank C. Keil. Cambridge/MA: The MIT Press: 193-4. Köhler, Wolfgang (1938): The Place of Value in a World of Facts. Liveright Publishing Corporation. Mouches Volantes. Eye Floaters as Shining Structure of Consciousness‘.